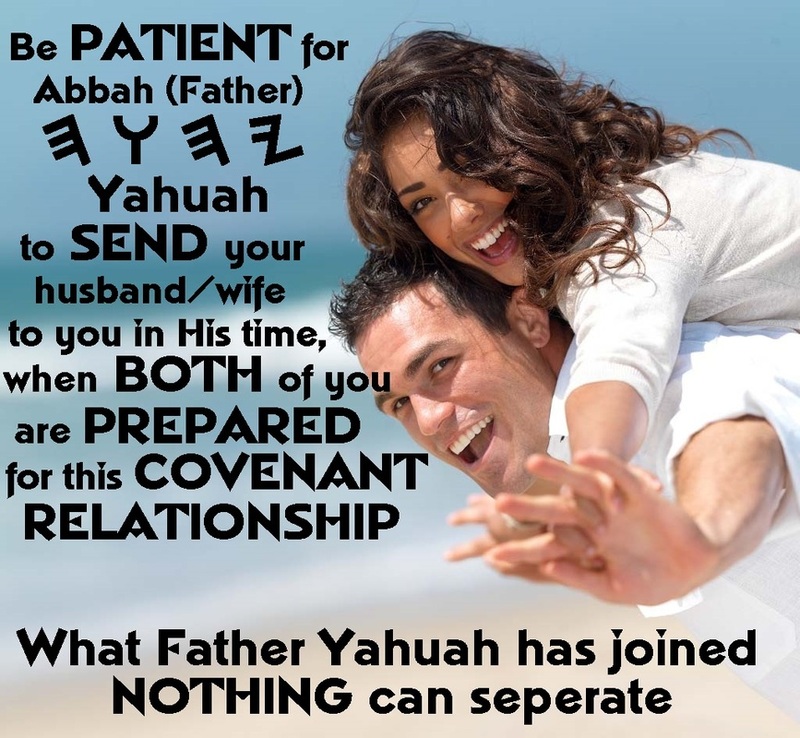 Does Father YaHUaH through Yahusha have the 1st PLACE and is He the 1st PRIORITY in Your Marriage? PLEASE NOTE that Scriptures quoted on this website are from different translations of the "Bible". The Titles "Lord" and "God" has been replaced with YaHUaH and Eloah as per the original Paleo Hebrew Scriptures (restored in various New translations of the Word). The name of our Messiah has also been restored to its original form, namely Yahusha! In the scriptures below, we will see that if Father YAHUAH is not the FOUNDATION of a MARRIAGE, it will crumble. YaHUaH, the Father should have the 1st place and be the 1st priority of both man and woman. As Messiah Yahusha is the head over the man and the man the head over the woman, the man needs to understand that He is responsible to YaHUaH for the well-being of the marriage as head and priest of the home. The marriage is a place of mutuality -- both parties seeking to SERVE one another and SATISFY (PLEASE) one another, always putting the others needs in front of their own. We see that marriage must be RESPECTED as a COVENANT (not an agreement that can be cancelled due to non-performance or dislike). It must be seen as an institution of YaHUaH, not to be taken lightly. Husbands must LOVE their wives unconditionally and be willing to sacrifice their lives for their wives as Yahusha sacrificed His life for us. Wives should submit to (not be abused by) their husbands as unto Messiah Yahusha! Husbands should honour their wives, be gentle & kind to them, be understanding and live in peace with them so that their prayers will not be hindered. 1Qorin'tiyim (Corinthians) 3:11 For no one is able to lay any other foundation except that which is laid, which is יהושע (Yahusha) Messiah. Mal'aki (Malachi) 2:14 And you said, “Why?” Because יהוה (Yahuah) has been witness between you and the wife of your youth, against whom you have acted treacherously, though she is your companion and the wife of your covenant. 1Qorin'tiyim (Corinthians) 11:3 And I wish you to know that the head of every man is the Messiah, and the head of woman is the man, and the head of Messiah is Elohim. Eph'siyim (Ephesians) 5:23-26 Because the husband is head of the wife, as also the Messiah is head of the assembly, and He is Saviour of the body. But as the assembly is subject to Messiah, so also let the wives be to their own husbands in every respect. Husbands, love your wives, as Messiah also did love the assembly and gave Himself for it, in order to set it apart and cleanse it with the washing of water by the Word. 1Qorin'tiyim (Corinthians) 7:3-4,33 Let the husband render to his wife what is her due, and likewise also the wife to her husband. The wife does not have authority over her own body, but the husband does. And likewise the husband does not have authority over his own body, but the wife does. But he who is married is concerned about the [matters] of the world – how to please his wife. Ibrim (Hebrews) 13:4 Let marriage be respected by all, and the bed be undefiled. But Elohim shall judge those who whore, and adulterers. 1Kepha (Peter) 3:7 In the same way, husbands, live understandingly together, giving respect to the wife, as to the weaker vessel, and as being heirs together of the favour of life, so that your prayers are not hindered.